Welcome to the five hundred and eighteenth of my blog interviews with novelists, poets, short story authors, biographers, agents, publishers and more. Today’s is with fantasy / SF author Terry Ervin. A list of interviewees (blogged and scheduled) can be found here. If you like what you read, please do go and investigate further. Morgen: Hello, Terry. Please tell us something about yourself, where you’re based, and how you came to be a writer. Terry: Hello, Morgen, thank you for inviting me to be interviewed. Morgen: You’re very welcome. Thank you for joining me. Terry: I am a husband, father of two daughters, an English teacher and author living in the Midwest of the USA (Ohio). How did I become a writer? Well, some years back I followed up on a promise I made to myself in college that some day I’d write a novel. I figured I’d better get on it, so I did. Morgen: “I figured I’d better get on it” I love it. What genre do you generally write and have you considered other genres? Terry: I write mainly fantasy and SF although I’ve had mystery, horror and inspirational short stories published. My main focus is the First Civilization’s Legacy series released by Gryphonwood Press. Currently there are two novels in it, Flank Hawk and Blood Sword. I’m busy working on the third. Morgen: So novels and short stories, what have you had published to-date? Terry: In addition to Flank Hawk and Blood Sword, I’ve had about a dozen short stories published in ezines, magazines and anthologies. I have a science fiction novel that has made it through the slush pile gauntlet and is now on the managing editor’s desk at a major publisher, but I still consider it a long shot. I’ve also written about a dozen articles on writing. Morgen: How exciting, do let me know how that goes. Are your books available as eBooks? Do you read eBooks or is it paper all the way? Terry: My novels are available in print, ebook and audiobook. While I’ve read a few ebooks (I don’t have a dedicated reader—Kindle / Nook—yet), I mainly read print, but also listen to audiobooks, especially while driving. I know this may be sacrilege to some, but I’m not a big music fan and talk radio can get old pretty quickly. A good story never gets old quickly. Morgen: I love to know more about how your audiobook came about (it’s my favourite format as I can be doing something else while listening) – perhaps you do write me a guest blog post. 🙂 Do you have a favourite character in any of your works? If any of your books were made into films, who would you have as the leading actor/s? Terry: I personally don’t have a favourite character, although some prove more interesting to write than others. Sometimes the secondary characters are pretty neat to create and write dialogue for as they participate in the storyline. 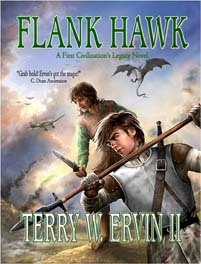 There is a short quiz on my website that folks can take to determine which character in Flank Hawk they are most like. A number of readers have commented on how my works would make excellent movies. The trick is getting the attention of a Hollywood producer. What actors would best play different characters cropped up as a discussion at Flankers (an unofficial fan page for the First Civilization’s Legacy series started by a reader). The odds of any of my novels making it to film are slim, but nothing wrong with dreaming—while keeping eyes and ears open for opportunities. Morgen: Science-fiction / fantasy seems to be as popular as ever at the movies so never say never. Did you have any say in the titles / covers of your books? How important do you think they are? Terry: Yes, I had input with both the titles and the covers. Maybe this is because my publisher isn’t one of the large ones, but we discussed the titles and the name of the series. The suggestions came from me, and we eliminated and revised until we thought we had what was the best. I had input in the cover art as well. Working with artist Christine Griffin has proven to be a great experience for me. I learned a lot as she developed the covers for both Flank Hawk and Blood Sword. She had a list of questions for me that guided her in the initial stages. Then she provided sketches and I gave feedback. Next, she did her thing. Her talent, I believe, shines in the covers. I think both cover and title are important. Let’s face it, humans are visual creatures. A cover is the first thing that catches a potential reader’s attention (unless the book is spine out on a shelf—then it’s mainly title/font and author’s name, and sometimes the publisher/imprint logo). Just as an interesting cover can be of benefit, a poor cover (art) and a weak title can easily discourage a potential reader, with them moving on to the next book. I’ve witnessed it at book fairs and conventions. Morgen: I’d love to draw as well as Christine. As you say, she’s so talented. And I agree, we are visual creatures. If I said to you ‘President Obama’ you wouldn’t (unless reading this interview) think of the words but a picture of his face (or a related image perhaps). Do you manage to write every day? Do you ever suffer from writer’s block? Terry: No, I don’t write every day, although I do manage to think about my current project every day and try to do something related to writing such as research or answering emails, or blogging. Summers, when I am not teaching and grading essays, I tend to have more time to write. Morgen: Which is… do you plot your stories or do you just get an idea and run with it? Terry: I get an idea for a story or novel and then plan it out. For example, with Flank Hawk, the initial thought that sparked the novel occurred while I was driving home from work. I was thinking about a few of the books I’d recently re-read, Zelazny’s Guns of Avalon and Harry Turtledove’s World War: In the Balance. One of the main turning points in Guns of Avalon occurs when Prince Corwin discovers a way to get gunpowder to function in the magical city of Amber. In the Balance is about an alien invasion during the height of World War II. The disparity in technology between the invaders and humanity is a major element in the novel’s conflict. Then I began to ponder, what would happen if a dragon encountered a World War II aircraft? Okay, maybe one can see how the line of thought formed. From there I began to devise a world where such an encounter could take place. Next came the people and creatures that would inhabit the world, how it came to be, and the long-running, multi-layered power struggle that would come to influence events in the plot that I was devising. Finally, came Krish and Lilly, Roos and Road Toad—the main characters in the novel. I generally know where the story will start and end. I list the main plot events I anticipate happening along the way, usually in a spiral notebook. It’s kind of like mapping out a vacation—the routes one will take and places to stop and visit. Just like in a vacation, some places are visited longer than anticipated, with a few surprises and additions along the way. Detours occur and places anticipated for a visit get bypassed. But, in the end, the destination is reached. Because I know where the story is generally going, I have a place to write toward and don’t suffer writer’s block. My bane is the lack of time. Morgen: I know very little about science-fiction / fantasy as I don’t read it (sorry sff lovers reading this) but I love it when it encompasses what we know, the world as we know it, but then go off at tangents. Do you do a lot of editing or do you find that as time goes on your writing is more fully-formed? Terry: I’ve yet to write a piece that didn’t need revision and editing. Actually, I enjoy the editing process more than hammering out that first draft. Again, like the music comment above, some folks will be scratching, if not shaking, their heads. I also edit for a small ezine, MindFlights, but there I don’t do much editing or copyediting. I mainly read submissions from the slush pile. Morgen: I enjoy editing other authors’ writing more than my own but a first draft is definitely my favourite aspect but then I don’t plan much, I wonder if that’s why. I have a submissions page and have added Mindflights to it (and a note saying the magazine usually welcomes submissions of science-fiction / fantasy fiction, reviews, essays, other non-fiction stories, poetry and artwork but is currently closed for submissions until 1st January 2013). It sounds like you’re a prolific reader, which authors most influenced your writing? Terry: Mainly it would have to be a combination of reading and studying the works of Roger Zelazny, Steven Brust and Stephen R. Donaldson. I could go into pages of detail and specific examples, but mainly from Zelazny’s works I learned about description, pacing and revealing plot details. From Brust I learned about dialogue and action, and from Donaldson, about epic-scale and world building. From all three I learned about characterization and overall storytelling. They, and others, including Fred Saberhagen, Michael Moorcock, Elizabeth Boyer, and C. Dean Andersson provided solid written and literary examples to recognize, study and learn, and for me to modify and implement in my own stories and writing style. To this day continue to study and learn. As an aside, if you try and enjoy any of my works, you should consider trying works by the authors mentioned above and visa versa—if you already haven’t enjoyed some of their works. Morgen: Unfortunately I’m a ‘dark and light’ writer / reader (crime and comedy) but that’s great advice for anyone reading your genre. Thank you. What advice would you give aspiring writers? Terry: Finish that piece you’re working on. Revise and edit and polish, and get it the best you can make it. Then, send it out there to find a home. There are so many writers that talk about writing, or start but never actually finish—and a lot of them have talent and real potential. I once ran across an aspiring author at a writers’ conference who had spent almost three years working on the first three chapters of her romance novel, and couldn’t get further. She insisted that they had to be the absolute best they could be because the first three chapters are normally what agents and/or editors ask for in a submission package. She was planning another rewrite after the conference, then let it sit awhile and review them again before possibly going on—if she was satisfied with the novel’s beginning. I suggested that she go ahead and finish the novel’s first draft and then go back to the first chapters. If nothing else, she might have a better perspective on where the novel went and a better understanding of the characters. She forced a smile and nodded at the suggestion, then changed topics (what panel I was attending after lunch). We’d exchanged business cards and I got an email from her about six months later, asking a question. I responded and asked if she’d gotten past the first three chapters. Never heard back. So, finish that novel (or short story), get it out there. And, while waiting for an acceptance, start a new project. If it gets rejected, send it to another market. Morgen: I’m terrible at submitting. Most of my current work goes on the blog or as eBooks but the latter earns me very little (because I’ve not been promoting them until my novels are ready, imminently I’m pleased to say) and the former even less (zero, because I don’t charge anyone) so I’m starting to send short stories out to paying markets. Apart from anything else, I want to see more of them in print. 🙂 If you could invite three people from any era to dinner, who would you choose and what would you cook? Terry: I’d invite G. Gordon Liddy, C.S. Lewis and Winston Churchill. Why? I used to listen to G. Gordon Liddy on the radio and also attended an event where he spoke. He’s a very interesting individual, knowledgeable in a number of areas beyond politics. C.S. Lewis because I’ve read many of his works, and even ‘taught’ a couple of his works to the Adult Sunday School Class at my church. His insight, logic and storytelling ability have always managed to keep my attention. Winston Churchill, because of his ability emerge and lead during such a pivotal time in history, and ability to use words to convey so much while motivating during desperate times. I selected three that, although not absolute contemporaries of each other, they would have a time period in common / close enough. How much could I learn just from listening to their conversation with each other? I’d cook French toast and bacon. I prefer Spam, but I know that’s not a favourite—and who doesn’t like bacon? Morgen: French toast and bacon sounds great (I love bacon), although I have three vegetarian / vegan friends – avid writers or readers) who would disagree. I like your choice of guests – I think they’d make lively conversation. Is there a word, phrase or quote you like? Terry: Here’s one by (you guessed it), Winston Churchill: “If you will not fight for right when you can easily win without blood shed; if you will not fight when your victory is sure and not too costly; you may come to the moment when you will have to fight with all the odds against you and only a precarious chance of survival. There may even be a worse case. You may have to fight when there is no hope of victory, because it is better to perish than to live as slaves.” Actually, the quote was the inspiration for my short story “Seconds of Eternity”. For a more fun quote: “Good. Bad. I’m the guy with the gun.” –Ash from Army of Darkness. Who doesn’t like Bruce Campbell? If you don’t know who he is, you’re missing out. Morgen: I am missing out (sorry, Bruce). Winston Churchill came out with some cracking quotes, as did Mark Twain. Are you involved in anything else writing-related other than actual writing or marketing of your writing? Terry: I moderate a crit group, Elysian Fields, and (mentioned above) reading slush for MindFlights. Terry: I keep busy. In addition to being a husband and father of two daughters, I teach high school English at a career technical school. I also teach e-courses for high school students trying to catch up for failed coursework or working to graduate early. This year I ran for and was elected to the village council where I live, and tutor neighbourhood kids on occasion. My wife jokes about my family that any Ervin who doesn’t have at least three jobs is a slacker. Morgen: Wow. You like to keep busy. Terry: For a hobby I raise turtles in my basement (eastern box turtles, red-eared and yellow-bellied sliders). Morgen: How sweet. 🙂 Where can we find out about you and your work? Terry: The main place would be my website: www.ervin-author.com. I also have a blog, Up Around The Corner. Terry: What are you working on these days, Morgen, and, based on your experience, do you believe it’s more difficult to find a publisher in the UK than it is in the USA? Morgen: It could be, but perhaps because we’re smaller. I did the usual thing whereby I went through the Writers’ & Artists’ Yearbook and picked a dozen (emailable) agencies to send my novels off to (I sent two at once which may not have been wise, although one was a 100K chick lit, the other a 50K mystery so at least they had a choice). All but one declined (very gracefully), the other didn’t reply (and had warned they may well not, which is a shame, especially via email. I know they’re all so busy but just a simple, “thanks but not quite right for us” isn’t hard to do). Anyway, I’ve since been approached by a London-based self-publishing company who has offered to pay to have one of my novels published (paperback only) so we’re hoping that’ll all happen this side of Christmas. Watch this space. 🙂 In the meantime, I have another (the mystery) back from one of my first readers so I’m going to go through that and hopefully get both books online as eBooks as soon as possible. I have two and a bit others written and am doing my fifth NaNoWriMo this November so another to add to the editing pile. I also plan to get another Writer’s block workbook and at least one more short story collection online by Christmas so I have my work cut out. 🙂 Is there anything else you’d like to mention? Terry: First, thank you once again for the interview! Morgen: You’re very welcome. Thank you for joining me, and thank you for all your comments on my forum. Terry: Second, although there are authors out there with far more experience than me, if readers of Morgen Bailey’s Writing Blog ever have any questions they think I might be able to assist with, or comments, don’t hesitate to contact me through my website. Who doesn’t like to get email? Just make sure the subject line doesn’t resemble spam (you know what I mean, not the good-eating canned meat stuff). Morgen: I’ve not had any (of the canned meat) for months but only remember enjoying it in small doses, like Marmite (Vegemite). I set up an Ask Me page recently and have had a couple of enquiries, maybe if I get any on SFF I can send them in your direction. 🙂 Thank you again, Terry. 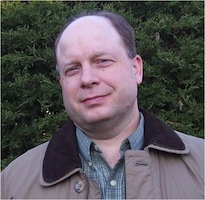 Terry W. Ervin II is an English and science teacher who enjoys writing science fiction and fantasy. He is an editor for the speculative fiction magazine MindFlights and a guest contributor to Fiction Factor, an ezine for writers. While Fiction Factor has published the majority of Terry’s articles on writing, his short stories have appeared in over a dozen anthologies, magazines and ezines. The genres of his stories have ranged from science fiction and fantasy to horror and inspirational. 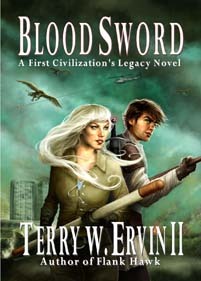 In late 2009 Gryphonwood Press published Terry’s debut fantasy novel FLANK HAWK and recently released the second in the First Civilization’s Legacy series, BLOOD SWORD. To contact Terry or learn more about his writing endeavours, visit his website at www.ervin-author.com and his blog, Up Around the Corner, at uparoundthecorner.blogspot.com. Wonderful interview. Great advice on finishing a piece of work. Thanks for reading and taking a moment to comment Cher Green. Glad you found the information useful.